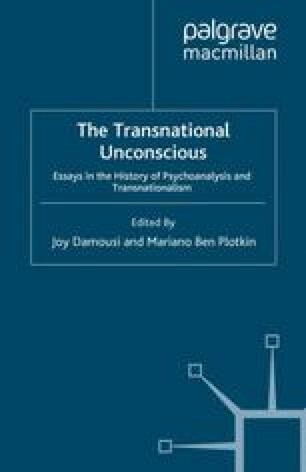 If the transnational trends set by début de siècle psychoanalysts pick up again, and if analysts follow the tone of modernism set at their Congress in 1918, the twenty-first century should establish new records for advances in psychoanalytic thought and care. Nearly one hundred years ago in Budapest, Sigmund Freud himself led the way with a call for “the conscience of society [to] awake.”1 In Germany, Max Eitingon and Ernst Simmel rushed to implement Freud’s Social Democratic covenant and to act on Freud’s belief in achievable progress with, among other strategies, “clinics where treatment will be free.”2 The British psychoanalysts of the 1920s got caught up in the spirit too, though their modernism was not, on the whole, as openhanded as that of their colleagues across the Channel. Almost without exception the analysts’ urban activism was located within and among nations where governments and citizens alike engineered deliberately new forms of social welfare planning. When we associate modernism with the history of psychoanalysis, we may perhaps envision a circle of intellectuals chatting at the Café Central, occasional incursions into art history, or even a sexually charged cinematic interpretation. Similarly, when the concept of transnationalism is coupled with psychoanalysis, we still respect the traditional distinct nation-state boundaries.